Jan Dale, the host of Melbourne’s PBSFM radio show called Southern Style, has advised us that she will be presenting two interesting programs next month. 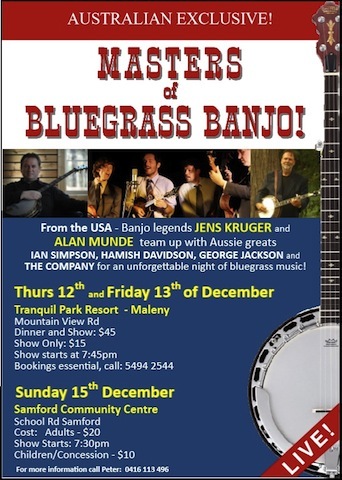 Jan Dale will be including a short segment on the music of award winning Bluegrass Banjo player Bill Emerson. Jan will be featuring an interview that she made in Nashville last October with Bluegrass banjo player Alan Munde, shortly after he received an International Bluegrass Music Association Distinguished Achievement Award. If you’ve not caught up with this insightful program on 106.7FM then do yourself a favour and do so. Southern Style features Bluegrass Music, both traditional and contemporary and explores this music’s roots and influences through Old-Time American music and some Acoustic Blues, Cajun and Western Swing. PBSFM also invites you to become a subscriber.